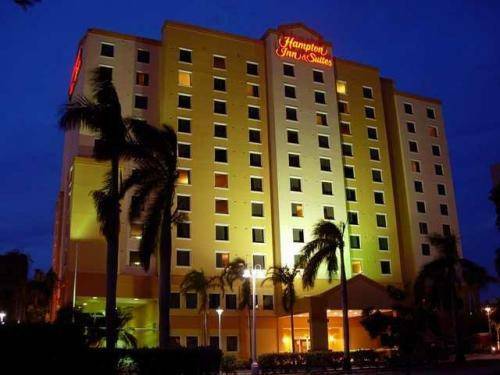 The Hampton Inn & Suites is between Blue Lagoon and Lake Joanne, three miles from Miami International Airport. The grand Vizcaya Museum and Gardens is a 15-minute drive from the hotel. Guests party with the beautiful people at uber-hot South Beach, 15 minutes away. Speaking of heat, you can catch basketball action at American Airlines Arena, home of the Miami Heat (also a 15-minute drive). This 11-story hotel has 149 rooms with your choice of a cushy king-size bed or two double beds. 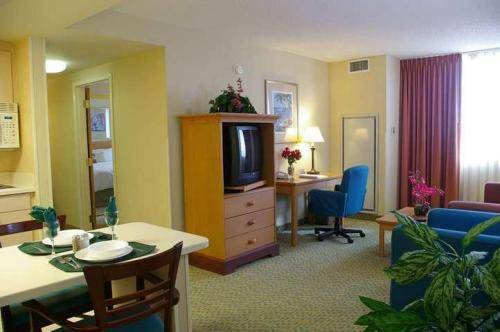 You can sprawl out on a pillowtop mattress, down comforter and fluffy pillows in front of a flat-panel LCD TV. Rooms also include irons and ironing boards. Two-room suites with full kitchens (featuring stovetop ovens, microwaves and refrigerators) are available. Guests can get to Googling courtesy of free high-speed internet access. In the morning, dig into a rotating menu of fluffy scrambled eggs, savory sausage, hot waffles and more at the complimentary hot breakfast. If you're in a hurry, grab a free breakfast bag with muffin, cereal bar, fruit and bottled water. Work up a sweat or just work anytime in either the 24-hour fitness room or 24-hour business center. 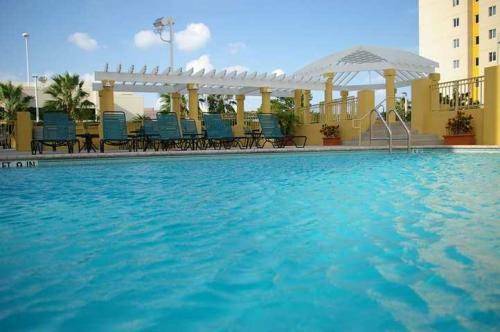 Guests splash in the refreshing outdoor pool and soak in the soothing hot tub. Parking is free, as is the airport shuttle. "Reasonable rates, good service" and freebies like a hot breakfast buffet get good buzz from Priceline guests at this Hampton Inn & Suites near the airport.